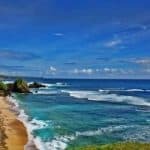 Home » Place » 13 Most Popular Island in Bali You Have to Visit! Bali is an escapist’s dream destination as there are so many places to visit. In Bali, going to a nearby island is just one boat ride away. 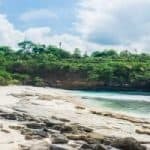 There’s an island that’s perfect for those who like some quiet time, the nightlife scene or those who want to know more about the wildlife in Bali. Find the one that’s perfect for you in these 13 Most Popular Island in Bali. There’s a reason why these islands are so popular among visitors all year round. 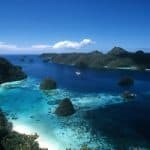 The Menjangan Island is most famous for its incredible underwater environment in Indonesia. You can reach it by riding a boat from the Labuhan Lalang or Terima Bay Port. The island is not too crowded by tourists. People can easily enjoy the sight of the coral reefs and the different species that live in it. Apparently, there are more than 200 different kinds. There’s also a shipwreck of a wooden boat that lies deep in the water for more than 100 years. Another thing that you can visit on this island is the Lord Ganesha temple. Unlike the Menjangan Island, the Gili Trawangan is an island that’s packed with human activities. People love to come to this island due to the romantic vibe that it gives off. Stay at the hotels available on the island to have a full experience of Gili Trawangan. There’s a popular swing called the Ombak Sunset Swing that’s right at the shore. It’s a great place to watch the sun sets with your loved ones. The nightlife in Gili Trawangan is great. There are party at the beaches and restaurants with the best food that you can eat. Gili Meno is the complete opposite of Gili Trawangan. It’s more calm and quiet. It’s the kind of place that’s suitable for people who are looking for a relaxing environment and privacy. On this island, late night parties are banned. Take it as an opportunity to appreciate the nature around you. The beaches are covered in white sands. The water is clear and you can snorkel to see the marine creatures up close. There’s even a turtle sanctuary that you can visit. If you’re hungry then get a table at one of the romantic restaurants in Gili Meno. Gili Air is a small island in Bali. Even so, it’s full of luxurious hotels and resorts for you to stay in. No need to worry if you’re tight on budget as there are many options to choose from. For a more quieter experience, you can go to their northern beaches. There are bars and small restaurants in Gili Air. Snorkeling is the most popular activity here. To reach this island, you can ride a boat from Sanur. 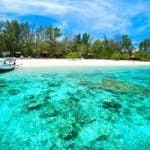 While you’re here, you can also give a small visit to the neighbouring Gili islands. Gili Gede is another quiet island that’s worth to venture around. To fully enjoy the island, you can explore by walking around. Have a stroll around the villages and you may spot a wild lizard every now and then. The villagers are friendly and warm to visitors. You can rent one of their boats for a tour. The locals will guide you through the island. For other activities, you can snorkel and fish in the water. To reach Gili Gede, you can start your trip from Bali to Menjangan Island. From there, you can make your way to Gili Gede. 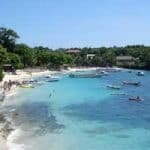 Nusa Lembongan is one of the most popular island in Bali. It’s close and will only take around 45 minutes to get there. You can take a boat ride from Sanur or the Benoa Harbour. The water is clear in Nusa Lembongan. A variety of activities can be done here including surfing, snorkeling, diving or simply watch the stunning sunset. There are resorts and hotels to stay in with great service. When you’re tired from having too much fun on the island, try out the massage and reflexology services offered on the island. Nusa Ceningan is so close to Nusa Lembongan that you can just walk over the bridge that connects the two islands. The bridge is a yellow bridge that’s actually the landmark of Nusa Ceningan. The reason why Nusa Ceningan is a popular island is because of its unique feature. There’s actually underwater temples and statues. You can see them by swimming underwater or get an underwater scooter ride. In other parts of the island, there are mangrove forests where you can see all the turtles nearby. Furthermore, there’s also seaweed farms that’s worth the visit. 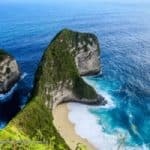 The next popular island is Nusa Penida. In 30 minutes, you can ride a boat from Bali to reach it. The island is often described as untouched paradise. Many temples are located here including Goa Giri Putri and Pura Paluang. The water surrounding the island is not to be missed. Take a dive in and you might meet some manta rays. If you’re lucky enough, you might encounter some whale sharks. A very important thing to remember when you visit this island is to bring some cash with you as there are no ATMs. Lombok is right next to Bali. It’s a beautiful island that garners a lot of tourists. Still it’s not as crowded as Bali though. 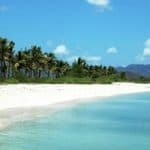 This gives visitors the chance to enjoy the beaches and popular spots around Lombok. 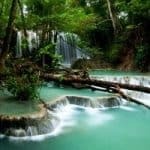 There’s waterfalls, a savanna and a volcanic mountain to explore. The food on the island is good and you can always rely on the kindness of the locals in case you get lost. To reach Lombok, you can go by boat from Padang Bai in Bali. Komodo Island is not so far from Bali. It’s a sanctuary island for the Komodo dragons. Here, they are protected and given the right kind of environment so that they can flourish. 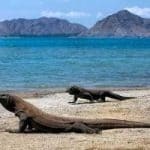 You can get a tour to see the Komodo Dragons and learn more about them as well. Other than seeing the dragons, you may also want to take a dip in the water. 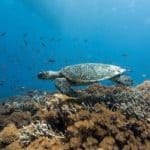 Unique marine species and coral reefs flourish underwater. It’s no wonder that scuba diving is a favourite choice among tourists. Moyo Island is mostly undeveloped. Left in its natural state, it’s an island that is considered as luxurious for its surrounding. The place is not crowded for people so it’s a great escape from all the hustle and bustle of the city. The majority of the Moyo Island area is reserved for wildlife sanctuary. It’s a great destination for those who enjoy snorkeling and diving to see the rare marine creatures in the water. Serangan Island is often called as the Turtle Island. The area is filled with sea turtles who find the place suitable for their nesting. The people on the island occasionally hold a release of the small sea turtles that people can join in. Though the island is small, it contains many spots worth visiting. One of them include the Sakenan Temple. You can also witness sacred dances being performed at certain times of the year. Serangan Island is also popular for surfing. Last but not least is the Shark Island which is right next to Serangan Island. The Shark Island is actually a conservation area for sharks. They even have a nursery where people can see the sharks. You may also feed them. If you’re brave enough, you can also snorkel to see the sharks up close. The Shark Island serves as an alternative way for sharks to be saved. 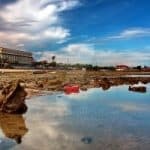 By coming to this island, you can learn more about the fishermen’s life along the coastline of Bali and how important it is to care for the native marine species. You won’t find islands like these anywhere in the world. So make sure to include one of them in your trip while you’re in Bali.